We were finalists in the National Seafood Awards 2018 in sustainability in aquaculture. A total of 37 individuals and businesses from the Irish seafood sector have been shortlisted. The Awards, dedicated to recognising the achievements of individuals and businesses revolutionising the Irish seafood sector under the key themes of Sustainability, Innovation and Competitiveness, where held in Dublin’s Christ Church Cathedral on 27 November 2018. A Student of the Year and a Lifetime Achievement Award was also presented under the Skills category on the night. Join us on our farm tour and see first-hand the life cycle of an oyster. As part of the tour you will enjoy the taste of oysters fresh from the Atlantic Sea. Our tour is a one hour guided tour by the oyster farmer. Pre booking essential, our bay is tidal and we can only offer tour when the tide is out. Our next tours will be Tuesday 26th June at 11.45pm. Wednesday 27th June at 12.30pm. Wear beach appropriate footwear, you may have to walk in a couple inches of water, depending on tide. The tour will involve a gentle 300m walk on the beach to the farm. All product from Irish Premium Oysters is destined for export, with 99 per cent going to Asia. Edward explains that product is packed twice a week, on Monday and Friday, arriving in Asia two days later. Edward says Irish Premium Oysters is growing organically at 10-15 per cent per annum and is now exploring opportunities closer to home in Europe. Edward prefers to work with one or two customers in each of his target markets. To maintain quality in production, Edward explains that the cold waters in the Donegal Bay slow down growth and allow the flavours to mature. Irish Premium Oysters operates a modern facility in Donegal. As a member of Bord Bia’s (the Irish Food Board) Origin Green programme the company is looking at ways to drive improvements, including packaging, electricity and water consumption. Edward believes this is an important element in sharing the industry’s story internationally. 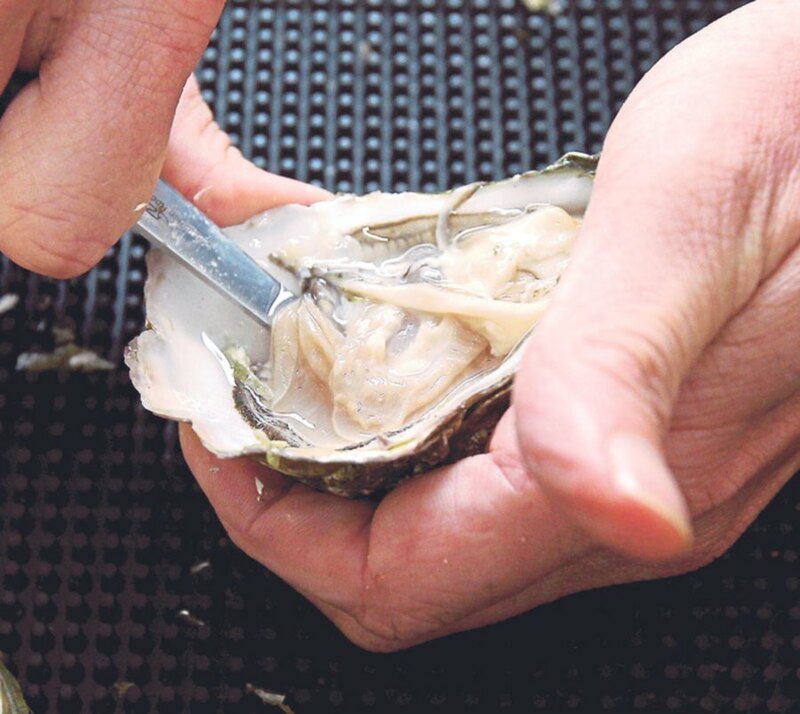 Irish Premium Oysters Ltd produces an Oyster which is unique to Traigheanna Bay. These unique oysters continue to grow in popularity internationally. Oysters are high in protein and low in fat and are highly nutritious, rich in zinc which is vital for a healthy immune system and are known as an aphrodisiac food which does have some truth to it, as their high zinc content is good for a healthy endocrine (hormone system) and libido. Oysters were originally transported wrapped in seaweed and sold by the barrel-full. Today all, oysters are graded and sold by category of weight. The quality of oysters are rigorously scrutinised by national and international buyers for conformance to weight, shell appearance and cleanliness. Traditionally oyster farmers have weighed per hand or on weighing scales, a painstaking task involving considerable cost in terms of manpower, time and the risk of error. Oysters were washed separately frequently imprecisely in a ‘DIY’ manner. In the last decade Ireland’s largest farmers recognised the cost-saving benefits of an integrated and synchronised washing and grading system allowing for greater inspection and scrutiny before dispatch. Several Irish farmers have recently chosen to renew their equipment and take advantage of recent technological advances. The Marine Times have learned of one such installation that has taken place at Irish Premium Oysters in Donegal. Choosing advanced technology introduced in the preceding two years by the Hardouin Company from the Vendee region of France, Irish Premium Oysters opted for the grading machine and associated equipment with the greatest count per hour capacity, reasoning that any current excess capacity could be made available in the future. This new machinery was then integrated and synchronised with a pre-existing washer system. Irish premium Oyster chooses Hardouin grading machines when they decided to renew their grading machines. Hardouin, a French company, is situated in the major oyster producing area in the Vendee and is the leading manufacturer of oyster grading machinery in France with over 300 in operation. With many farms in France being small family affairs the capacity of grading machinery is varied and ranges from maximum weighting capacity of 6000 an hour (small manual turnstile) to the largest available capacity of 19,000 (22 cup). The option of linear grading lines is also available. Different options are available in terms of washers and baggers. The company also proposes machinery for the mussel industry. Using the latest electronic equipment, the major innovation to the latest generation of Hardouin grading machines is its motorised cup system which increases speed, efficiency and long-term reliability. This innovation together with a remote maintenance capacity has given the company a major impetus to export. With a growing presence in Canada, the UK and the Netherlands the company now has six such graders in operation in Ireland along with other machinery such as washers and baggers. Operating Hardouin grading machines: In brief terms the grader is fed post-washing by a synchronised feeding system that places a single oyster in each cup of the circular grader where it is weighed and directed to one of 6 pre-programmed weights exists. A control box (in effect a computer) allows for maximum flexibility whether in terms of synchronised speed control, pre-programming of grader exits or count (bags/oysters/weight). Having found the speed associated with the 22-cup grader (approx. 19,000 weightings/hour at full capacity) excessive, for current production, the speed of the machine was subsequently reduced to a more manageable 15,000 weightings an hour with the option of increasing capacity/speed in the future. A requirement for Irish Premium Oysters was the annual maintenance and service contract with a commitment for a Hardouin technician to be on site if problems cannot be solved remotely. It can be clearly seen that the use of the automated graded greatly increases the numbers of oysters that can be processed per hour. The actual numbers of oysters graded varied with type of seed (e.g. hatchery or FBS seed, wild seed and lantern net seed), with greater numbers of oysters graded when from hatchery of lantern net sources as opposed to wild seed. Also the numbers of oysters processed varied with size. There was a significant improvement of using the automated system when compared to the manual screening performed previously. In addition for hatchery seed without handling, approximately 19 times the amount of 12mm seed were processed per hour when comparing to projected values, indicating that the handling capacity of the system far exceeded expectation. Handling significantly reduced the amount of seed capable to be processed per hour (from 165,429 to 22,316). Also it appears that the type of seed processed is important, as greater amounts of lantern net seed and hatchery seed (unhandled) were processed per hour (165,429 and 69,782 respectively) when compared to wild seed (16,911). In each case, more than double the amount of seed was actually graded per hour when compared to projected values of automation and are much greater than seen in the manual system. In conclusion the new automated system is far more efficient at grading oyster seed and is therefore significantly improving the efficiencies of operation for shellfish farmers. Irish Premium Oysters are delighted with their investment, ‘Increased production and efficiency will allow us to screen the young oysters more frequently which in turn will produce a higher quality product. The technology offered an immediate impact with an increase in economic and environmental productivity through reduced production costs, an increase in product quality which will ensure the long term sustainability of the company and industry,” says Edward Gallagher MD Irish Premium Oysters. A Donegal company has signed a major deal that will lead to oysters from the north-west being exported to China. Irish Premium Oysters, located at Traigheanna Bay, near Lettermacaward in south-west Donegal,is sending 192 tonnes of oysters to China. The news comes after the company hosted a significant Chinese delegation on Firday headed up by Mr Li Qinwu the Secretary General of the Guandong Enterprise Association for foreign Investment and Ms Kairan Xie of the Guandong Council for the promotion of small and medium enterprise. The delegation flew into Donegal airport and from the outset they were highly impressed by the scenery and the welcome they received from Mr Edward Gallagher of Irish Premium Oysters, his family and staff. The visit was coordinated by Ms Yan Zhao, China Sales Director for Jade Ireland Seafood. Accompanying the delegation was Ms Susan Sun of Shenzhen North-South Import-Export Ltd. Ms Sun has been introduced to Edward’s Award-Winning Oysters by Ms Yan Zhao of Jade IrelandSeafood, who market a range of Seafood Products in China under the Ocean Jade Brand and represent Irish Premium Oysters in China. According to Ms Sun the quality of the Irish Premium Oysters were exceptional and the purpose of her visit was to sign contract with Edward Gallagher for 192 tonnes of his Oysters for the Chinese market. Commenting on the deal, Mr Edward Gallagher said that the success of his product was down to the unspoilt unique location in west Donegal and being able to convey the naturalness of west Donegal through the company website, in promotional material and stunning local photography, it was only natural that buyers would want to come here to see it for themselves. To find out more about Irish Premium Oysters and its operations in Donegal see the promotional video below. Commenting on the Deal Deputy Pat the Cope Gallagher, Leas Cheann Comhairle of Dáil Eireann welcomed the Chinese Delegation to Donegal, and stated that this was a good news story for west Donegal and a vote of confidence for Irish Premium Oysters, the Gallagher family and all their staff. The Chinese delegation outside Donegal International Airport. In particular the Delegation Leaders were highly impressed with the Airport and its environs and warmly welcomed to Donegal by Ms Anne Bonner, Managing Director and Mrs Pauline Sweeney, Marketing Manager from Donegal Airport (pictured). They were particularly moved by the presence of the Chinese flag alongside the European, Irish and Donegal flags. Upon hearing that the Airport was the second most beautiful in the world, they have suggested a promotion! It is hoped that further Chinese business people will come through the Airport in the coming years and months. Donegal company, Irish Premium Oysters has signed a significant contract with the Chinese market. A Chinese delegation visited Donegal this week to sign a contract which will see 192 tonnes of oysters be exported to China. Donegal Deputy Pat the Cope Gallagher says this is an important investment not only for the company but for coastal communities, in particular, Donegal. On Friday the 9th of June, Irish Premium Oysters, located at Traigheanna Bay, Co. Donegal hosted a significant Chinese delegation headed up by Mr Li Qinwu the Secretary General of the Guandong Enterprise Association for foreign Investment and Ms Kairan Xie of the Guandong Council for the promotion of small and medium enterprise. Accompanying the delegation was Ms Susan Sun of Shenzhen North-South Import-Export Ltd. Ms Sun has been introduced to Edward’s Award-Winning Oysters by Ms Yan Zhao of Jade Ireland Seafood, who market a range of Seafood Products in China under the Ocean Jade Brand and represent Irish Premium Oysters in China. According to Ms Sun the quality of the Irish Premium Oysters were exceptional and the purpose of her visit was to sign contract with Edward for 192 tonnes of his Oysters for the Chinese market. Commenting on the Deal Deputy Pat the Cope Gallagher, Leas Cheann Comhairle of Dáil Eireann welcomed the Chinese Delegation to Donegal, and stated that this was a good news story for west Donegal and a vote of confidence for Irish Premium Oysters, the Gallagher family and all their staff. The newly secured market deal with the Chinese Delegation is a very significant development for the company and will provide great security moving forward for the company and their employees. Irish Premium Oysters offer to the market top quality oysters, taken and farmed in the most pristine waters in Western Europe which guarantees an absolute first class product to all their customers and now to the Chinese market which they have newly secured as a result of this deal. I wish to compliment all those involved in this deal and wish the new venture every success and to acknowledge that investments such as this make a significant contribution to coastal communities’ right throughout the west of Ireland and Donegal in particular. THERE are two things in life you should probably never do fast and under immense pressure — getting married, and shucking oysters in record time. If they’re not done properly, both can wind up in pretty tragic situations. Thankfully, the latter doesn’t require lawyers and a whole lot of money if things go awry. Just ask Zeeshan Ehsan, the young and enthusiastic bar supervisor at Southern Rock Seafood in Bangsar. He’s the very first Malaysian Shucking Champion, a title he earned at The Great Malaysian Shuck Off. The competition, organised by the Southern Rock Seafood Group, sees both professionals and amateurs trying to pry open as many oysters in the shortest time and is the much anticipated highlight of the annual KL Oyster Festival. Malaysia’s first oyster shuckingchampionship demonstrates our growing love for oysters. Zeeshan shucked and presented 12 oysters perfectly in just one minute and three seconds,” remarks a beaming Mostaq Ahmed Rabby, the manager of Southern Rock Seafood. “During the four-hour event he must have shucked at least 600 oysters. Shucking at the restaurant as Mostaq points out, is a daily ritual where 55 out of the 60-strong staff are armed with the knowledge and skills to shuck oysters. “Out of that figure, 35 of them are professional shuckers,” he shares, emphasising what serious business shucking is. Around the world, professional shuckers are opening their own oyster bars and are also in high demand at black-tie events, private parties and festivals. The revival, as food and culture critics explain, is sparked by the “farm to fork” movement in recent years. As Rowan Jacobsen, author of A Geography Of Oysters: The Connoisseur’s Guide To Oyster Eating In North America reveals, oysters are valued for their uniqueness in a market of seemingly mass produced food. “It’s part of the new interest in foods that are authentic. Oysters are the opposite of supermarket food,” says Jacobsen. 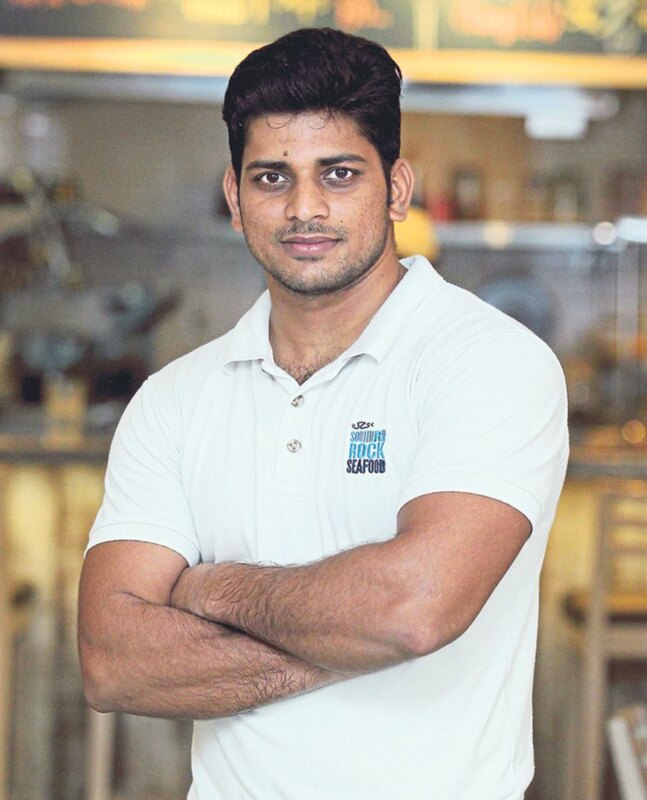 Zeeshan Ehsan will be representing Malaysia in the World Oyster Shucking Championship in Ireland this September. Malaysia is no different. “There’s definitely an increase in appreciation for oysters here,” says Josh Green, the director of Southern Rock Seafood which started its fresh seafood distributing business in Malaysia 17 years ago. Malaysians loved them when we first brought them in. You know, they eat everything!” he adds with a laugh. But as Green explains, oysters were not something commonly found in the country nor is the oyster-eating culture part of our heritage. In the past, you’d need to go to a five-star hotel to try oysters and they were mostly frozen oysters. 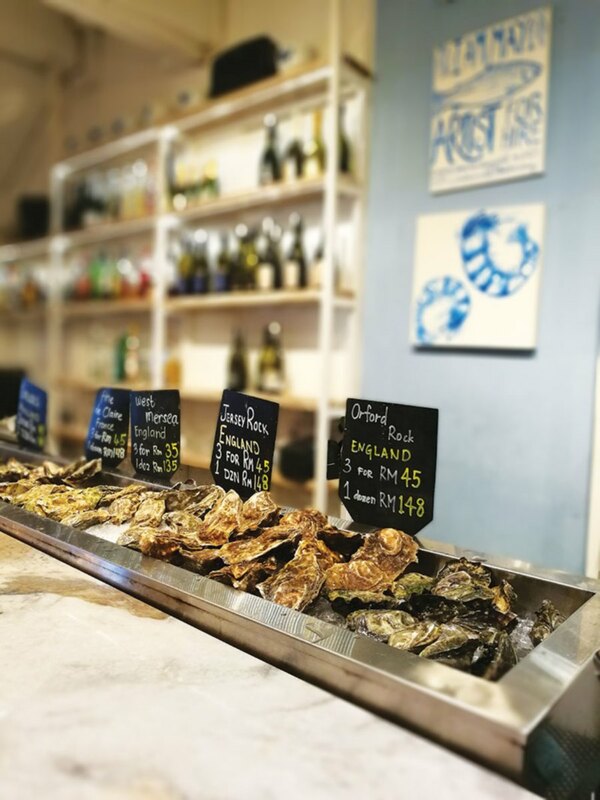 Now at oyster bars, you can have freshly shucked oysters of different variations,” he shares, noting that Southern Rock Seafood sells about 15 variations of fresh oysters from seven different countries. As he points out, no two oysters are the same — they vary in sweetness, saltiness, creaminess and umami intensity, depending on climate, where they are farmed and what kind of water they are farmed in. Other than the diverse flavours, a lot more people are keen to try fresh oysters because unlike before, oysters are shucked right in front of them,” he says referring to the times when patrons were served oysters which were already shucked, frozen and washed. “Eating an oyster shucked right in front of you is the definition of fresh. Patrons are very fascinated by the way we shuck oysters,” says Zeeshan, who admits to the impressive ability of shucking an oyster blindfolded. “Sometimes they want to try, but we can’t allow that because that’s very dangerous,” he confides, recalling a time when a colleague had slashed his arm when his knife slipped. At first glance, he doesn’t look like someone who was just crowned Malaysia’s very first Shucking Champion. He wears a shy smile but when talking about oysters and shucking, his eyes light up and his shyness dissipates. “I didn’t feel nervous. maybe because shucking is second nature to me now. I’ve been shucking up to eight dozen oysters a day for almost two years. I think I was quite calm during the competition,” says Zeeshan who is from Sarghoda, Pakistan. That’s hard to imagine considering the cheering crowds, the pressure of finishing fast and not to mention the competition —12 top finalists from the capital city’s most renowned restaurants and hotels. On top of that, the shuckers had to impress judges Jimmy and Marion Gallagher of Gallagher’s, one of Ireland’s most notable oyster farming families. The secret to a good shuck is to detach the muscle without cutting it. We are proud of sporting heroes like Datuk Nicole David and Datuk Lee Chong Wei. Now our people can have a crack at the top slot at another important sport — oyster shucking!” Green says with a laugh. He is giddy with excitement when he talks about the World Oyster Shucking Championship in Ireland. “The dream is to produce a world champion from Malaysia!” he says as he clasps his hands enthusiastically. “At least we are represented there,” he says of the iconic Galway Oyster and Seafood Festival which has been running for over 60 years. The rules of the Great KL Shuck Off are challenging. Internationally, it will be even more demanding. “You can get penalised for quite a number of things — when an oyster is not presented upright, if there is shell or grit in the flesh, if the flesh is cut or if blood is found in the oyster, for example,” explains Mostaq. In Ireland they will be using oysters native to Galway, which are flat, as opposed to the Pacific oysters used in the Malaysian round of competition. To air freight these oysters for practice, Green points out, is an expensive affair, but one that’s worth the price. It’s going to be tough, considering it will be our first time competing on the world stage, but it’s going to be worth it for the boys to represent the country,” he says of Zeeshan, and the runner up of the competition, Mohd Fizly Norazlan, a fellow shucker at Southern Rock Seafood. THE World Oyster Shucking Championship is a 60-year-old tradition in Ireland’s Galway Oyster and Seafood Festival, and this year, Malaysia is stepping up to the plate. Southern Rock Seafood restaurant has hosted the Kuala Lumpur Oyster Festival since 2015, and things are heating up as the first Malaysian Shucking Championship kicked off. 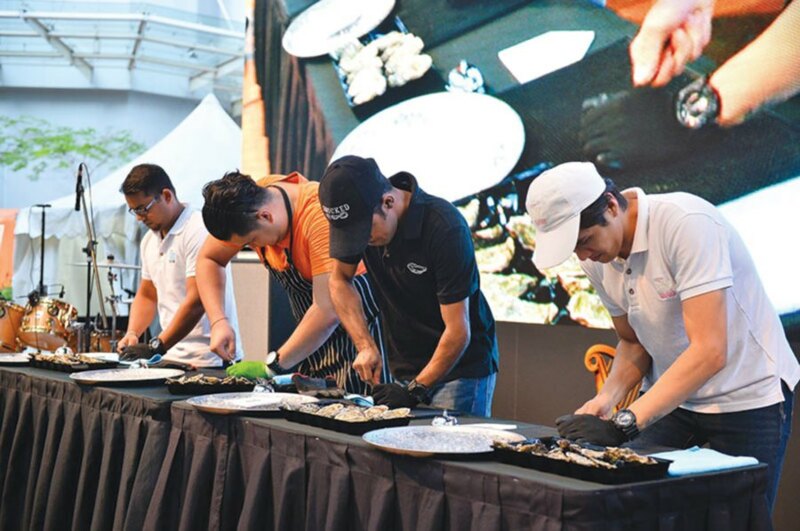 The competition brought oyster shuckers within the Klang Valley to compete, with 12 contestants vying for a spot in the qualifying rounds for the semi-finals and finals during the festival at the restaurant in Bangsar, Kuala Lumpur on May 14. Each participant shucked a dozen Irish premium oysters and was evaluated based on speed, presentation and shucking technique, with Guinness sponsoring the Malaysian champion to compete at the world stage at the Galway festival. Southern Rock Seafood Sdn Bhd big chief Loges Kessarivan said they sell at least two tonnes of oysters in Klang Valley alone, but was inspired to bring the competition to Malaysia after a visit to the festival in Galway. Oysters were not that popular 10 years ago, but like what’s happened to coffee and wine, oysters are being cultivated, so more people are beginning to appreciate it. 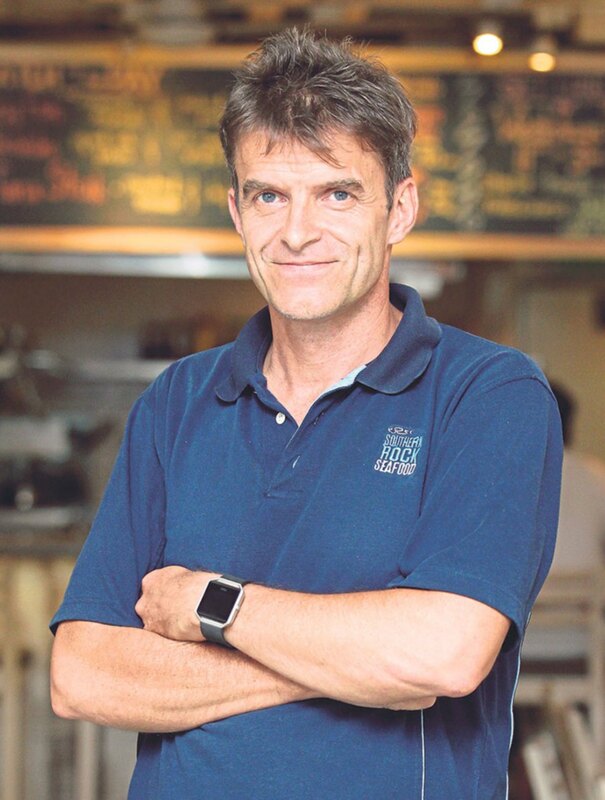 Loges, an oyster masterclass instructor, said they plan to hold the competition yearly, teaching students from culinary institutes in Malaysia how to shuck oysters. Marion and Jimmy (both seated) assessing a contestant’s shucked oysters, while Loges looks on. We are planning to go to the different states from Penang to Johor Baru, maybe even Sabah and Sarawak, to bring in more parti­cipants in years to come, making it even bigger in three years’ time. A family of oyster farming experts for the past 28 years, the Gallaghers earned the prestigious title of World’s Best Oyster, and flew in from Ireland to lend their expertise to the competition. Jimmy Gallagher and his daughter Marion acted as judges. When I first started, I did not know an oyster was from an egg,” joked Jimmy. We started with a target of distributing five tonnes a year, but now it has grown to 200 tonnes a year, and we are the first from Ireland to export to Asia,” he added. Marion explained the intricacies of oyster shucking, first by using an oyster knife to break the seal and prying open the oyster, and then finely slicing the muscle and flipping it over. It usually takes at least two-and-a-half to five years to grow an oyster, and it is the meat content that differentiates the top of the range – so we flip over the oyster because it is better presented that way,” she explained, while showing off the plump oyster flesh. “Shuckers are tested on their shucking skills and how clean they have cut the oyster muscle from the shell, getting points for those without debris and additional points for presentation. Aside from all the shucking and slurping of oysters, visitors also had a feast to choose from a number of mouth-watering snacks with drinks to wash them down. To set the mood was the Fariq Auri Trio, a Malaysian Celtic fusion band who piped up Irish melodies; a poem composed about the Gallaghers by poet Cat Brogan; and music from percussionist Lewis Pragasam and his band. Children were not left out of the carnival festivities as there was a face-painting station and a clown twisting balloon shapes. Contestant Mohd Fizly, 23, from Southern Rock Seafood, has already won three oyster shucking competitions in Malaysia.